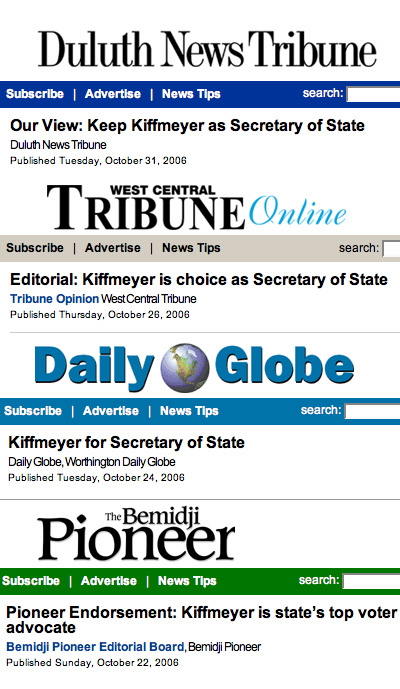 Minnesota's incumbent Secretary of State candidate Mary Kiffmeyer appears to be picking up endorsements right and left: in a single week, she nabbed the nod from the Bemidji Pioneer, the Daily Globe in Worthington, the West Central Tribune in Willmar, and the Duluth News Tribune. And so does her ticketmate, Republican Jeff Johnson, who is running for attorney general: within days, he got noteworthy endorsements from the Detroit Lakes Tribune and the same Willmar and Worthington papers as Kiffmeyer. But what looks like a Republican groundswell surging across rural Minnesota can be explained more simply: all seven editorials expressed the political preferences of one man, a practice that's more common than you might expect. William C. Marcil is the president and CEO of a media mini-empire that owns the Fargo-Moorhead Forum, all the newspapers mentioned above, and around 30 other publications--not to mention a half dozen printing houses, three broadcast stations and an internet service provider. But when it comes to political endorsements, the company name, Forum Communications, is a bit of a misnomer: endorsements aren't determined through open debate and discussion by members of a local editorial board; they're decided upon by Marcil in his Fargo office and emailed to papers in Minnesota, the Dakotas, and Wisconsin. Brad Swenson, editorial page editor of the Bemidji Pioneer, confirmed the policy in an interview yesterday. "Technically, it's part of the job. He owns the paper, he can say who gets endorsed," he says, adding, "Personally, in a lot of those races, I'm not voting that way." While it's unusual to have such centralized decisionmaking, it's not uncommon for publishers to wield their political or personal philosophies over editorial boards, says Kelly McBride, Ethics Group Leader at the Poynter Institute. "Most editorial boards are a mouthpiece for the publisher," she says, although she believes such practices are a "slight problem." "I’d prefer to see the more traditional model, a decentralized model where individual publishers in individual newsrooms guide that process," she says. "The thinking is that, although you represent Corporate, you live in this community. You know the community and what’s best for [it] better than some far-flung corporate office would." This year's slate of Marcil-tapped candidates includes Kiffmeyer and Johnson, Tim Pawlenty (who will be endorsed by the paper tomorrow), and auditor Patricia Anderson. On the Minnesota Transportation Amendment, all Forum-owned papers are instructed to take a "no" stance. Also getting the nod are two Democrats, Amy Klobuchar and Collin Peterson. It's been this way for a long time. In 1990, The Forum's editorial page editor Jack Zaleski wrote, "An editorial board (at least The Forum's) is not a democracy. Marcil has the biggest vote--the only vote in certain circumstances." A more current verification of this fact comes from Mike Jacobs, publisher and editor of the Grand Forks Herald, which was recently bought by Forum in June after the previous owner Knight-Ridder was purchased by McClatchy. While he wasn't available for comment on this piece, he wrote in the October 29 edition that "all Forum-owned newspapers endorse the same candidates in statewide races and take the same positions on statewide ballot measures." He adds that, after coming out on the losing end of a discussion in which he argued against endorsements altogether, Marcil concluded, "Endorsements are an important responsiblity of newspaper ownership." But is the responsibility of newspaper owners to local readers or to a political agenda? Marcil's leanings are decidedly Republican--and aside from a few endorsed Democrats over the years--seems to affect his official editorial stances. According to the Federal Elections Commission, Marcil has given $26,850 in individual political contributions. Of that, $2,000 went to GOP candidates (George W. Bush, Duane Sands, John Dorso), $7,250 went to the Republican National Committee, and the rest was donated to a PAC run by the National Association of Broadcasters, which in the 2004 cycle favored Republicans over Democrats by a nearly two-to-one margin of giving. If that responsibility is to, say, democracy, how is the citizenry served when a Fargo-based individual opines on the best federal or state candidates in, say, Duluth or Stillwater--or, for that matter, Hudson and River Falls, Wisconsin? Swenson says that while papers are given no copy points for penning endorsements, Forum management has in past years offered to supply verbatim text upon request. For local races or in the 8th Congressional District (where Jim Oberstar is the Pioneer's preferred candidate), editorial boards are free to arrive at their own conclusions. Things have changed at Forum Communications' flagship paper, Zaleski says: the Forum went from being a paper that "read like a newsletter for the Republican party" to one that this year has publicly sided with Democrats Klobuchar and Peterson (although Swenson retorts, "I challenge you to find a more conservative candidate than Peterson, from either party"). Regardless of the political allegiances or specific endorsements Marcil makes, there's a bigger question. Marcil's opinions are broadcast, sans disclaimer, to newspapers that have a combined weekday circulation--more than 246,000 papers--that surpasses even the Sunday edition of the St. Paul Pioneer Press (245,875), according to Minnesota Newspaper Association documents. That sizable figure is sure to decrease as the newspaper industry loses readers to other media outlets, like the internet. On top of that, endorsements are meant to spur debate, McBride says, not to influence elections. "It’s been a long-held understanding that editorial endorsements don’t actually influence a race very often, and they’re not really meant to," she says. "What they’re meant to do is engage an audience in a dialogue. That’s why you have the op-ed page—opposite the editorial page--where you have dissenting voices, a wider variety of voices." "Part of the problem with the editorial pages in general is: it’s not the process by which they arrive at their product but the product itself -- which is notoriously boring." Cross-posted at the Minnesota Independent.